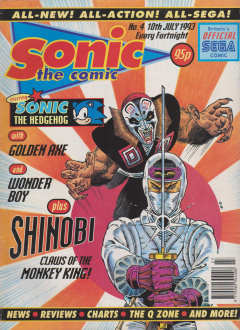 Sonic the Comic 4 is the fourth issue of the Sonic the Comic series by Fleetway. 1 Sonic the Hedgehog - "Day of the Badniks"
Sonic the Hedgehog - "Day of the Badniks"
In the Emerald Hill Zone, Ruff the dog tells his friend Stripes the badger that he saw Sonic - it must have been Sonic because nobody else can spin like that. They try to follow Sonic, but when they find him he appears to be destroying a Star Post, and they run away. In fact, this isn't Sonic at all: it's a Badnik Sonic! Later, while Ruff and Stripes are debating whether what they saw was really Sonic, they are ambushed by badnik versions of themselves and installed as organic batteries. Elsewhere, Tails tells Sonic that he was seen destroying Star Posts, and they go to investigate. They find that a Star Post was indeed ripped from the ground, but before they can look further they are attacked by the Badnik Sonic. Sonic and his robotic counterpart attack each other head-on, but Sonic is knocked back. Tails decides he has to help, but unfortunately his attack collides with Sonic who is then captured and installed as the badnik's organic battery. Tails knows he now has to save Sonic, but he finds he is surrounded by other badniks. Even worse, Robotnik appears in a new set of armour and says he intends to make Tails a badnik too! Robotnik explains that he has been destroying Star Posts because he has just set up a new base in the Special Zone, and he wants to destroy the only means of accessing his new domain. However, no sooner has he explained this than his Badnik Sonic grabs Robotnik's moustache and hoists him off the ground: Sonic has not been taken over by the badnik's programming, and has retained his own personality. He demands that Robotnik release the captives and destroy the badniks, or he will perform a Supersonic Spin while still holding onto Robotik's moustache. Robotnik reluctantly agrees, then flees still with Badnik Sonic's hand gripping his facial hair. Robotnik claims that he has big plans, and Sonic vows that he'll be waiting. The concept of an organic battery is mentioned for the first time: badniks in Sonic the Comic are not roboticised animals, but rather robots that install captive animals as their power sources. Star Posts appear for the first time, and are mentioned as the only means of accessing the Special Zone. Robotnik refers to the events of Sonic the Comic #2, "Robofox" when threatening Tails with being turned into a badnik. Robotnik reveals that he has set up a new base in the Special Zone. The base first appears in Sonic the Comic #21, "Girl Trouble, Part 1". Sonic refers to Tails as "Pixel Brain" for the first time. It will become an enduring nickname. Joe Musashi discovers a stage prepared for a performance of the Peking Opera. He recognises a man on stage as the Monkey King, the most famous of all opera characters, famed for his trickery and his mastery of Kung Fu. In fact, the man is a Neo Zeed assassin in costume, but his skill at monkey Kung Fu is exceptional. Musashi attempts to interrogate the man about the whereabouts of Musashi's love, Naoko. As expected, the Monkey King refuses to talk: he knows that if he fails to keep Musashi from Naoko then he will be punished with a slow and terrible death by the masters of the Neo Zeed, "the Four", and their elemental powers. Musashi defeats the Monkey King by employing some trickery of his own, and leaves the Monkey King to his fate. He then progresses to the next level, where a masked man is waiting to ambush him. Ax-Battler and Gilius-Thunderhead battle Ul-Tima and her skeleton minions outside Corpselands, where the sorceror Blackspell intends to resurrect Dark Guld by sacrificing Tyris-Flare. Gilius defeats the skeletons and Ul-Tima by using his earth magic, and they go inside. Meanwhile, Blackspell recites the incantation to resurrect Dark Guld, whose body has been laid out next to a bound Tyris in front of Dark Guld's tomb. Using her fire magic, Tyris is able to escape her bonds just as she is about to be killed, then she steals the Golden Axe and begins to attack the monsters around her. Ax and Gilius arrive and join the fray. The resurrection part complete, Dark Guld's body is reanimated. Guld attacks Blackspell for ending his rest, and the two grapple within the old tyrant's tomb. However, the spell was not completed and as the three heroes (Ax, Tyris and Gilius) watch, Guld and Blackspell are combined into a single body with two heads! Shion the Wonder Boy attempts to stop the demons from carting away another village. The demons' leader, Grimomen, is impressed with Shion's prowess and blasts him with a magical spell that catches his hand... which slowly becomes blue, scaly and clawed. The demons burn the village and take the captives away under the water, after casting submersion spells on the wagons. Shion is secretly led away by a young girl named Baila, who gives him an amulet to let him breathe under water. However, while Shion is following the carts, he is attacked by an octopus. This page was last edited on 16 April 2018, at 16:49.